I was filled with pride for our students and Art teachers this week as I attended the award ceremony for winners of awards from the Burton Art Gallery Schools’ Exhibition. The Art Department received an award for outstanding contribution, which is quite an achievement for such a small school. 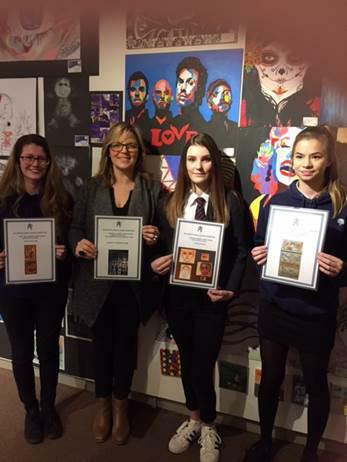 Three of our students also received individual awards for their pieces of work: Katie Jayne Lambe, Ellie King and Beth Gifford. It was lovely to see parents of the three girls attending the event and sharing in their child’s success. The artwork in the Gallery is wide ranging in style and subject content. It showcases work of many different medias and scales. Don’t forget the exhibition is on during the whole of month of February, so still time to visit if you haven’t had a chance yet. The Burton Art Gallery is an amazing space which showcases some quite famous visiting art work, all under a pretty little roof in Bideford. It has a super gift shop full of arty gifts, art materials and books and it has a lovely cafe too. You can keep up to date with exhibits and events by ‘liking’ their page on Facebook.